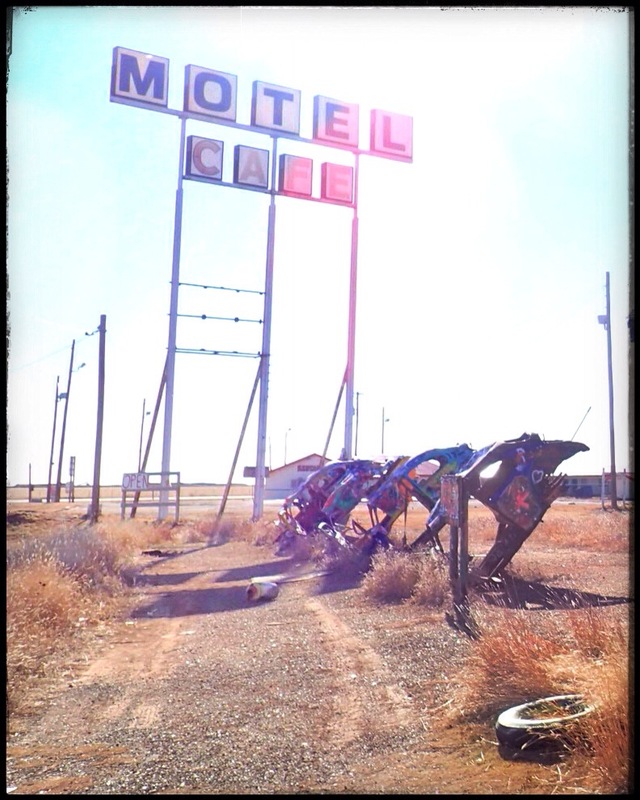 The last town before Amarillo– or the first after leaving– on Old Route 66, is the ghost town of Conway, TX. Before I40 was routed 1/2 mile north of town, Conway consisted of ranchers and farmers who settled in the area in the late 1800s. The town grew after the Choctaw route of the Chicago Rock Island and Gulf Railroad came through in 1903. In 1967, the Crutchfield family opened a service station and souvenir shop at the I40 exit to Conway. Two years later, the town peaked at a whopping population of 175 people, but a year later, more than half of them had moved away. By 2000, only 20 people remained, and by 2002, the Love’s truck stop across I40 was the main draw in the immediate area. Undeterred by the big guys across the highway, one of the Crutchfields had an idea to lure in customers. 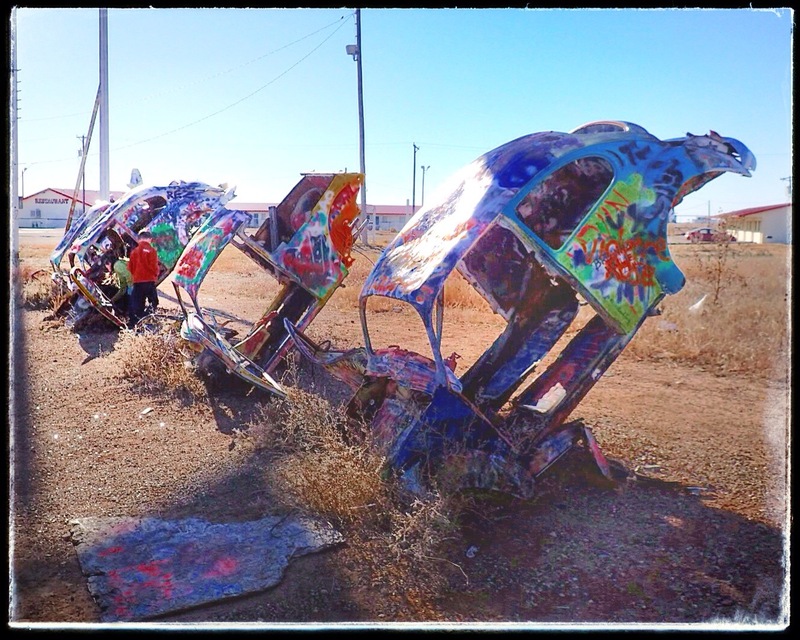 He had always loved the Cadillac Ranch out west of Amarillo, so why not create a parody of the attraction east of the city? 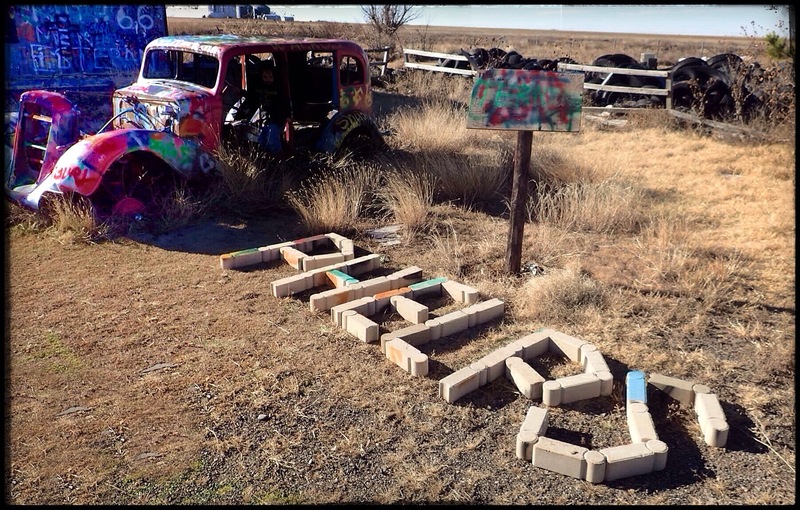 He put his knowledge of off-road equipment to use and buried five Volkswagon Beetles nose-down, a la Cadillac Ranch, in front of their station. It wasn’t long before the spray painting began. Speaking of souvenir shops, I think I need to interject something here for a quick second. I was a little surprised at the lack of nick-knacks, tchotchkes, tshirts, and other miscellaneous crap available with “Rt66” emblazoned on it. Though relieved not to be nagged constantly for a bunch of crap by my kids, I am sure we could have found something wonderful that we couldn’t have lived without. I’m not sure how I’m going to survive without a Rt66 keychain, or how I am gong to feel in six months when I am not yelling at the rest of the Crazy Train when I retrieve a broken Rt66 snow globe from under the seat of the car. But I digress. Back to Conway. The Crazy Train had almost as much fun at the Bug Farm as they did at Cadillac Ranch. 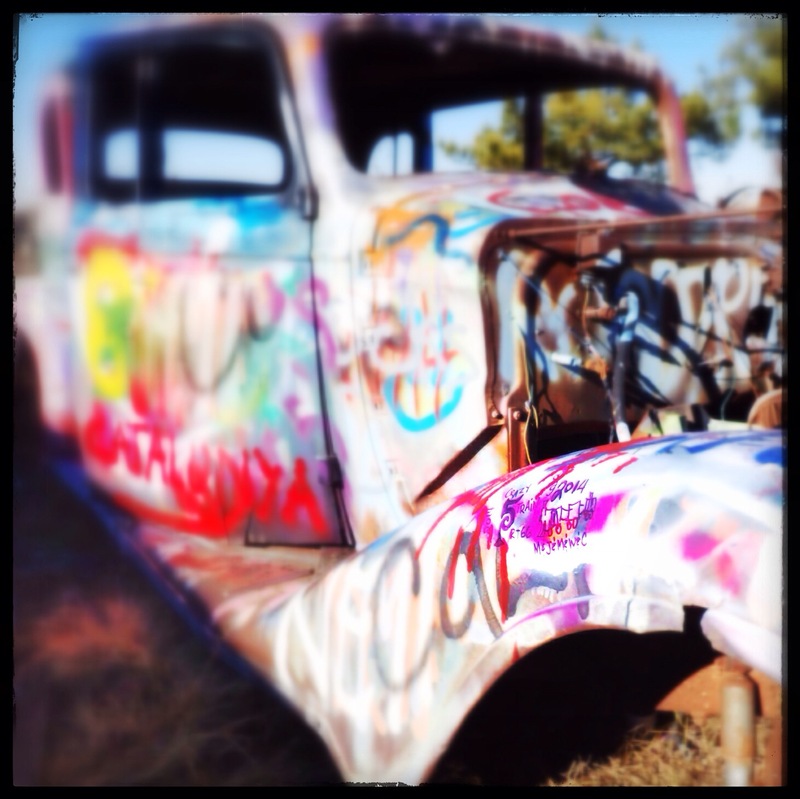 We climbed around an old Ford(? 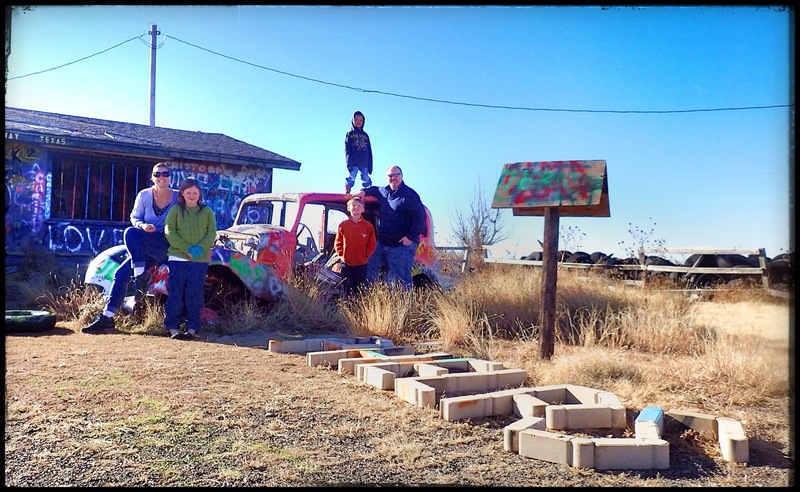 ), took a fantastic family picture, and William even found a partially filled can of spray paint and the kids got to leave their mark both east and west of Amarillo. 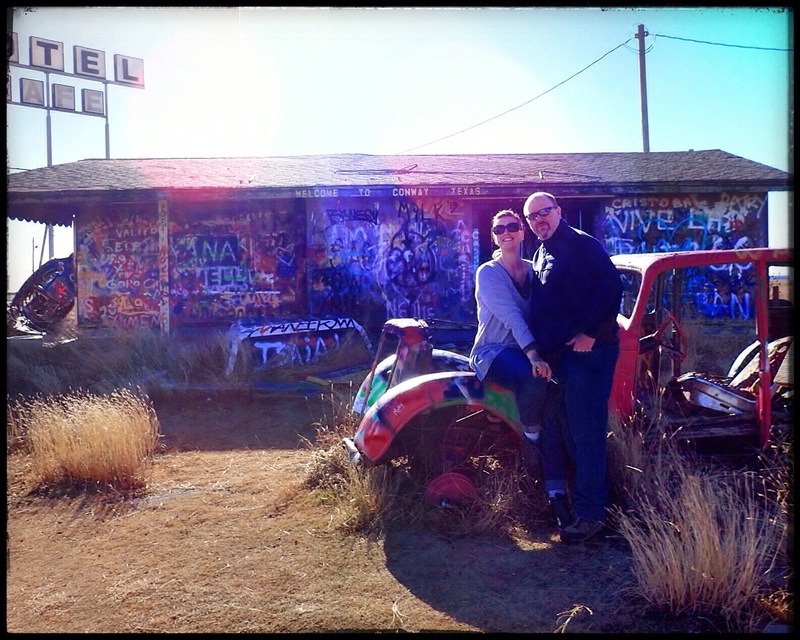 We were the only ones there, and it was a little warmer and slightly less windy than Cadillac Ranch had been. It’s definitely worth a stop.